Blackburn Central light GoPro mount by DullBoyJack is licensed under the Creative Commons - Attribution - Share Alike license. This adapter takes the mounting sled from the Blackburn Central Smart light and adapts it to a standard GoPro mount. You will probably need to print this with supports, as the underside has a recessed area for the sled to sit in properly. 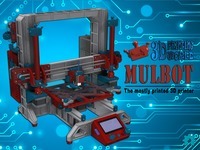 Say thanks by giving DullBoyJack a tip and help them continue to share amazing Things with the Thingiverse community. We're sure DullBoyJack would love a Tip, but unfortunately they have not setup their accounts to receive them yet.